Omaha, Neb.-based Werner posted adjusted net income of $53.6 million, or 75 cents a share, in the three months ended Dec. 31, compared with $30.6 million, or 42 cents a share, in the year prior. Revenue climbed 14% to $646.4 million from $567.4 million. The results were better than expectations by investment analysts on Wall Street as pricing remained solid while expenses for labor and fuel were less than projected, according to a report by Christian Wetherbee, a senior research analyst at Citibank in Morristown, N.J.
Truckload transportation services generated operating profits of $66.8 million in the fourth quarter of 2018, a gain of 50% from $44.5 million in 2017. Revenue increased 13% to $494.7 million from $439.2 million. Average revenue per tractor per week rose 6.9% to $4,145 from $3,878 and the total number of company-owned and owner-operator tractors in service increased 5.2% to 7,820 from 7,435. One-way truckload revenue increased 6.2% to $204.3 million in the fourth quarter of 2018 from $192.3 million, but total tractors actually declined by 3.3% to 3,320 from 3,435. Dedicated revenue grew 17.9% to $215.3 million from $182.6 million and the total number of tractors increased 12.5% to 4,500 from 4,000. 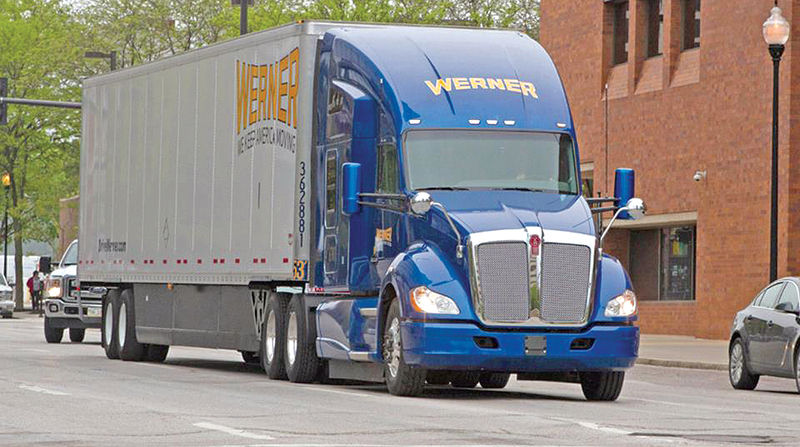 Werner Logistics generated operating income of $7.2 million in the fourth quarter of 2018, a gain of more than 250% from $2 million in 2017. Gross revenue increased 22% to $137.2 million from $112.4 million. Logistics revenue grew across all business units, Werner officials reported, led by a 23% gain in freight brokerage business and lesser gains in intermodal, freight management, freight forwarding and final-mile businesses. For the full year, Werner reported adjusted net income of $171.4 million, or $2.38 a share, on revenue of $2.46 billion in 2018, compared with adjusted net income of $92.4 million, or $1.27 a share, on revenue of $2.12 billion in 2017. Werner ranks No. 15 on the Transport Topics Top 100 list of largest for-hire carriers in North America and No. 21 on the TT Top 50 list of largest logistics companies.